Visits: 172052 persons viewed this recipe. 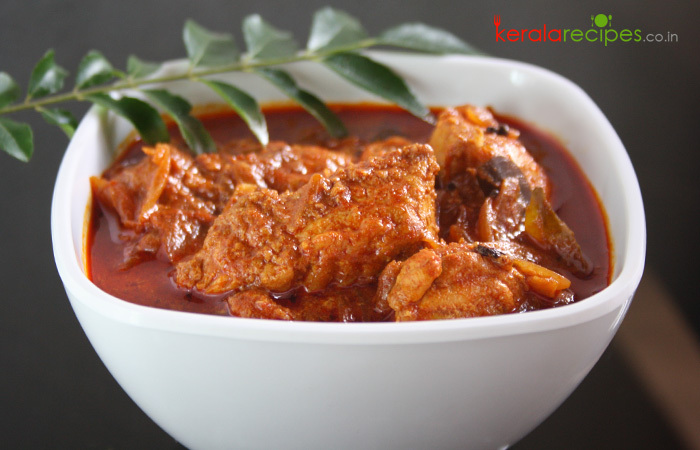 Kerala fish curry or Meen curry can be prepared in many ways. Here you can try a traditional fish curry recipe without using coconut or coconut milk. This dish is also called as toddy shop fish curry. Fish is a good source of nutritional contents like Omega-3 fatty acids, proteins, minerals and vitamins. Usually Kerala fish curry (meen curry) is prepared in open mouthed earthenware pot for better taste. It can be prepared by adding coconut or without using coconut. Soak Brindleberry in 2 cup of hot water with little salt added in it. Chop shallot, ginger and garlic finely. Kashmiri chilli powder, normal chilli powder and turmeric powder should be made as a paste adding little water. Heat 2 table spoon coconut oil in a cooking pan (recommends open mouthed earthenware pot), put mustard and fenugreek seeds. When it splutters, to this add finely chopped shallot, ginger & garlic and stir well. When it becomes golden brown, reduce the flame and put chilli and turmeric powder paste into it. Stir it well in a very low heat for few minutes (till the oil starts appearing). Add socked Brindleberry and water to the pan and allow to boil. When it boils put fish and add salt to taste. Reduce the flame and cook till done (it takes 10 to 15 minutes). When it is done add curry leaves and ½ table spoon coconut oil & remove from the flame after 1 minute. Kerala fish curry is ready. Let the curry remains in the cooking pan for a few hours, allowing all the spices to steep into the fish. 1) Don’t stir once fish is cooked. 2) Remember to spoon the Brindleberry / Kukum star (Kudampuli) pieces out after few hours. I have been searching for this recipe for ages.. good to see the same.. Gonna make this yummy fish curry 2mrw or so.. thank you so much! Found your website from Sandeep Mangalath, l will definatly try above recipe, However I have a query, is Fenugreek Seeds are available readily in market or is that something special to Kerala? Can we ignore it? Hi Kshama, Glad you liked it Fenugreek Seeds/powder are available in all supper markets. It is optional for Kerala fish curry. You can ignore it if you don’t have. Hi Shaan, I did not try ur dish so far, yet I liked the way u presented it in ur website. Neat, clean, simple and easy to understand. The traditional dishes I had seen in my childhood had lot of mixing of various ingredients in traditional ‘arakallu’ to make what we used to call ‘arappu’. In the modern day recipes we hardly see any such process. (instead of arakallu it can be mixi in modern days). Almost all dishes (shown/seen in various media) have the same process of starting with heating oil, adding mustard seeds, shallot then adding the powders (like chilli , coriander, turmeric) then adding the main item (fish, egg, chicken etc). This is the common methodology for almost all the curry dishes. Hence the base taste remains the same. Why like this? But the dishes we get in restaurants are not so. Why like that? What is the extra things done there? I appreciate your rational thinking. Every place has their own common ingredients and base tastes. That is why we call them Chettinadu, Mugal, Continental, Arab, Thai and so on… In my point of view, regarding restaurant preparation and homely preparation, the major difference is nothing but one is private and other is commercial. In private, the term ‘Profit’ has no role whereas in business ‘profit’ has major role. Hi Sheena, I am really happy that you found what you were looking for. Most of our traditional dishes are coconut based. Anyway I will try to post some recipes without coconut. Thanks again for the feedback. I am really happy to see like these recipes. I am sure that it tastes good. I had this curry so many times. Because this is what the way my mom cook (fish curry). Hi Vincy, Thanks a lot for sharing your feedback. Happy to know that you like the recipes posted here especially the Kerala fish curry. Hope to see you here often. Generally which fish will be good in this meen curry? Hi Mary, You can use any fish of your choice to prepare this curry. I want to try this with coconut milk. When can i add into this? Hi Sreekala, You can add coconut milk just before adding curry leaves (step 9) and no need to add the coconut oil (step 9) when you are adding coconut milk. Remove from the flame before it starts boiling. One small tip. After washing the fish, rinse it with Kokkum water to eliminate all slimy stuff (ulumbu) from the fish and wash it in clean water before adding to the masala. Hi Prasanna, Thanks a lot for sharing the tip. I think we can also use lemon juice or vinegar water for the same purpose. Hi Meera, Thank you very much for your nice words of encouragement. I will be posting more recipes soon. Hope to see you here often. I can’t wait to make this recipe, I am making fish curry this weekend, hope will come up good like yours. Wish me luck. I have been searching for this recipe. I used to make fish curry almost same as mentioned. But now very clear about what exactly to do. Thank you dear! What can you substitute kokum with? Hi Tasneem, For the authentic taste of kerala fish curry, I strongly recommend you to use kokum. But you can replace it with tomato or tamarind. I tried, this is superb. Thanks a lot. I think if we make Garlic paste little more quantity then the Curry will be more thicker. Hi Santhosh, Thanks for the nice words. If you like garlic, add it more, you will get little more thick gravy. I am going to try this curry which I had been searching for. The methodology presented is simple. Suresh, Thanks for the comment. Hope you will share the feedback. Excellent recipe Shaan. I was hunting for a recipe like this. A bit spicy, but i guess if you add half tsp of dhaniya powder it’ll be fine. My husband & kids enjoyed it. Thanks a lot. Nancy, It is pleasure to know that you found what you are searching for. Thank you very much for the feedback and also for the tip. Thnks for recipes…. m going to try..
What kind of fish we can use in this curry? Please don’t say all kind of fish. I need some names. I am a beginner in cooking. Shanto, Thanks for the comment. You can use the fishes like Seer, Tuna, Shark, Mackerel, Sardine, Salmon, Red Snapper etc. Hi Shaan, Really happy to go through your site. You are doing a good job by providing simple and easy method to cook delicious Kerala food. I will definitely try a few and update the feedback. Dear l am from karachi. I want a recipe of orotti with fish. l like kerala food. Saleem, I am glad that you love Kerala dishes. I will try to include the orotti recipe soon. Hope you will try other Kerala dishes listed here. Hai Shaan, Am from Bangalore. I tried this fish curry it was soo tasty.. Thank you so much for the recipe. Hi Shyni, Great to know that the fish curry turned out well for you. Thanks for taking time to share your feedback. I have been trying few recipes of fish curry without coconut. I will definitely try this as its not too complicated and sounds delicious. I will post my feedback later. Rania, Thanks for the commment. Hope it will work out well for you. Going to make this one…!! very precise description…!! thanks a lot! I normally use coconut for my fish curry. I tried this for the first time and it came out perfect. Thank you for keeping all the recipes simple and easy to understand. Keep up the good work!!! Hi Geo, Thanks for your above recipe. We are from Trichur and we never make fish curry like this, we add coconut paste or milk to our curries. Believe me, I tried your recipe and all of us liked it. Sibin, Thanks a lot for sharing your feedback. Glad you all liked it. This is actually a toddy shop fish curry. People from Kottayam area also follow is method usually. Hello & thank you for your recipes, I am not sure what kokum is, can I use tamarind instead??? You are welcome Rita. You can use raw mango or tamarind as an alternative to kokum star. But kokum tastes better for this particular preparation. Hi Mr Geo, Very Interesting Recipe I will try this today. I hope it will taste well. Thanks, Anyway I am from Philippines married to Keralite, I really love cooking as well and learned variety of south Indian recipe and willing to learn more. Sarah, Thanks for finding time to share your feedback. Glad to know that you love cooking very much. Hope you will try more Indian recipes from this website and see you here often. Hello Shan, tried this simple and tasty fish curry. Thanks for the recipe. Instead of pouring hot water to the kokum and then to curry I directly put the kokum to the curry while boiling. Will there be any difference in taste if put as you mentioned? Suma, Thanks for trying this fish curry recipe and also for the feedback. In either way, there won’t be any significant difference in the fish curry gravy. But the fish pieces tastes better, if you add the socked kukkum with water. Shan chetto, njanga dubail chetaide recipe vechu oru poli polichu. Thankyou so much. I had just looked into a recipe which had no Garlic and Ginger rest is same. Now, wondering what will be the difference between these two types of preparations. Going to try with ginger and garlic… lets see… will keep you posted! Oh Hi Shaan…. today my wife has referred your recipe of making fish curry without coconut or any coconut substitute…. I will comment once I eat it. Hi Shaan, this fish curry recipe seems very similar to what we prepare at home except we add little coriander powder too… Anyhow thank you so much for your recipes, especially the way you depicted is remarkable. And I appreciate your effort of sending replies to all who giving their feedback. Good Luck. Anju, Thank you very much for your kind words of encouragement and wishes. Hope to see you here often. Hi, I am really keen to make this curry as it sounds delicious but not sure I will be able to get Kukum Star in New Zealand. Are there alternatives? Thanks. Wendy, Thanks for the comment. I think Kukum star will be available in most of the Indian stores in New Zealand. You can use raw mango as an alternative for Kukum Star. Ghee Rice Adi Poli. Thank u so much. I have just made this curry. It is sublime. I added some coriander seeds and some fresh coriander at the end. Try It.. Its Wonderful! Glad to know that the Kerala fish curry turned out good for you. Thanks for trying this recipe and also for the tip. Hi, I tried this recipe and it came out well… Although it was very watery, so to make little thick I added finely grinded coconut paste just 2tbsp, since its for was for rice, if it was used for tapioca, coconut can be avoided.. It was really cook… Thanks. Divya, Thank you very much for the feedback and tip. Hope you will try more recipes from here. Hey… thank you soooo much. Your recipe helped me to give surprise my family. Very simple and easy steps. Please can u post picture for each steps. Means it can help people like me(beginners). Other than that its a wonderful recipe. And for other viewers plz visit and encourage people like him. Because he is doing a great job. Divya, Thank a lot for the feedback. Happy to know that my recipes helped you very much. There is some practical difficulty in placing the photographs in each step. But I have a plan to create the videos of each recipe in the future. Thank you very much for the suggestion. Hi, please can you tell me what kukum star is? Can we add ginger garlic paste instead of chopped ginger garlic. Elizabeth, you can add GG paste. Instead of didn’t adding coconut or coconut milk, this curry tasted is very nice & even very quick in making. Thanks for the recipe. Siciliya. Thanks for replying me Mr.Geo, actually me and my elder sister loves south Indian food, so if we want any recipe so we will probably come in you website. Thanks Siciliya Convey my regards to your sister. Kudampulike pakaram nadan puli upyoogichal preshnamundo. Ravi, Just wash the kokum (Brindleberry) before soaking it in the water. I made this curry, easy to make but I guess the chilly powder of 2 1/2 tablespoon made the curry very mirchi and everybody was coughing what can be done to reduce the chilly? Jins, I think you added normal chilli powder instead of Kashmiri Chilli powder. If you don’t have the Kashmiri chilli powder add only 1 1/2 table spoon of normal chilli powder. Water is from the kodumpuli or extra water can be added? Jins, we use the Brindleberry soaked water to prepare the fish curry. No need to pour extra water. I liked the recipe, but which fish should be used. Thanks for the recipe. Finally I could impress my husband, he loved the fish curry. Sonisha, Glad to know that you did well and your husband liked it very much. Hope you will try other recipes too. Thank you for the recipe. I’m planning to cook fish curry with your recipe today. One doubt- How many days we can keep this curry refrigerated?. Bino, Thanks for trying this Kerala fish curry. According to my knowledge not only coconut oil overuse of any oil will leads to cholesterol. I don’t believe that coconut oil has more cholesterol than others. Its very tasty and came out well. Thanks for ur wonderful recipe. Kavitha, Thanks a lot for your wonderful feedback. Hi Shaan, I was really searching for this dish. At last I have found it. Thanks so much for this yummy recipe. I am really gonna try this dish at home. Thanks a lot. Vani, I’m glad that you found the fish curry recipe which you were looking for long time. Thank you very much for the feedback. I have tried this recipe with sardines. This curry tastes good with hot rice and Mumbai pav. Rani, Glad to know that you done the fish curry well and enjoyed it. Thanks for the feedback. Hi Shaan hw r u? I also like cooking. In my childhood I experienced a lot. But now not getting much time for cooking. Anyway I like your way of presentation and will try this Kerala fish curry soon. Do you know how to make snacks like murukku, achappam, pakkavada etc. Try to post like these too…. have a nice time. Doing well, thanks. How about you? It is pleasure to know that you love cooking. I will try to include more snacks recipes. Thank you very much for your words of encouragement. Hi Shan, thank you very much for this delicious fish recipe. I must try this Sunday and will inform you later. Have a good day. Very nice. thanks. Keep posting good recipes so that I will get good compliments from my family members by cooking your delicious recipes. Thanks Noyal I will try to include more recipes. Naveen, Thanks for trying this fish curry recipe and also for the feedback. Philo, Thanks for trying this recipe and also for the feedback. Thank you so much for this recipe. Njan ithe reethiyil thanne anu fish curry undakkaru. But I wont get the taste which my mom made. To day I will try this also. Thank u Shaan. It came out well and yummy. Thanks for the recipe. I am making this for a church perunal. Can you tell me approx how many pounds of fish would be needed for about 45 people — considering that there will be other dishes too? From that I may be able to extrapolate the other ingredient quantities. Regina, it requires 9 pounds of fish to meet your requirements. Thanks for the comment.